Notice: The screen shots in this tutorial are from OS X 10.6. The process should be very similar, if not exactly the same, for other versions of Mac OS X. 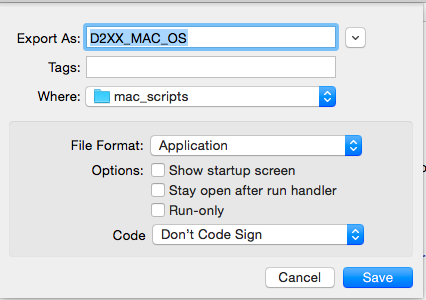 If you are on **OS X 10.10 Yosemite**, follow along to install the drivers. If you need to install drivers on Yosemite, [please visit the bottom of this section](#yosemite). Most people will be using the VCP drivers and not the D2XX drivers. Note for Educators: You will most likely need to obtain administrative privileges from your network or IT administrator in order to install these drivers. 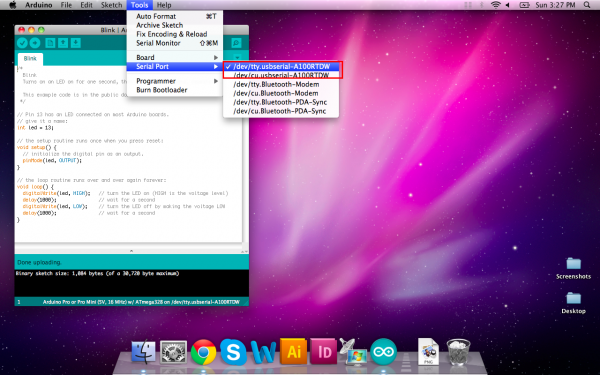 Most of the time, when you install Arduino on Mac OS X, the drivers are installed automatically. However, if there was a problem with the installation and you don't see any options that include 'usbserial' under the 'Tools -> Serial Port' menu, then you will need to install the drivers. 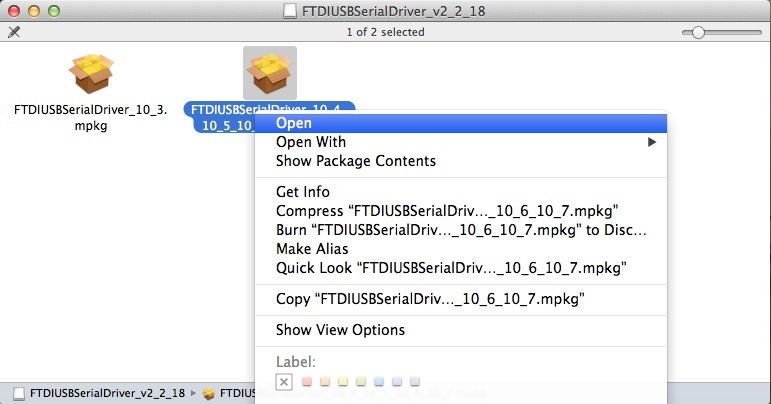 You may also need to install the full FTDI drivers if you are running OSX 10.10 or later. The factory drivers are not complete. a.) OS X 10.9 (Mavericks) or above: Download this driver. Locate the file FTDIUSBSerialDriver_v2_4.2.dmg file that was downloaded to your computer, and double click on it to open \ run it. 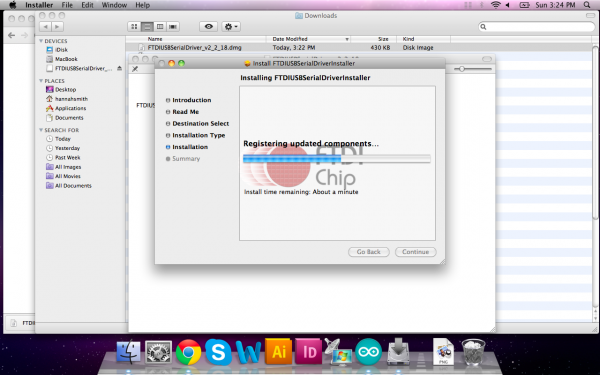 You may need to visit FTDI’s VCP Drivers page for the latest download of the Mac OS X FTDI Driver. 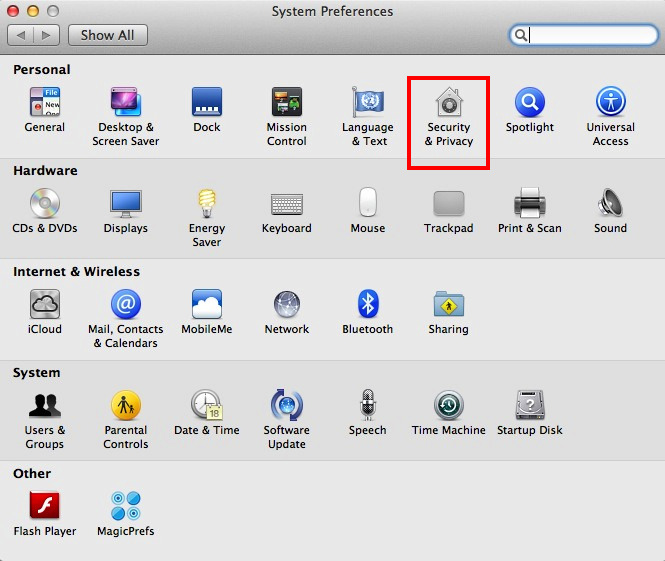 Click on the link for the "Mac OS X 10.9 and above" driver's version. The image below shows version 2.4.2 so you would need to click on **2.4.2* to download the latest driver. 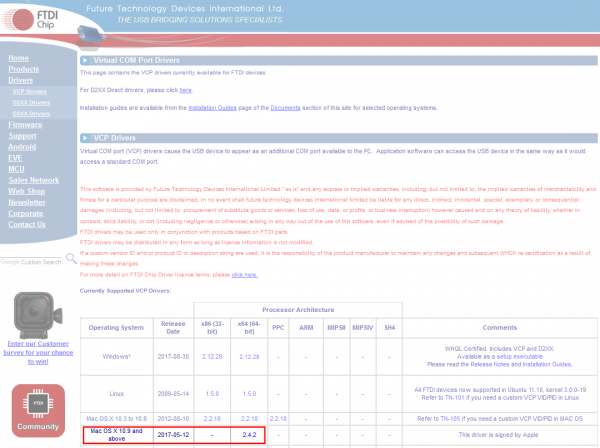 If there is an update to the drivers by FTDI, the version number will change but it should be in the same location on the table. b.) OS X 10.8 (Mountain Lion) or lower: Download this driver. Locate the file FTDIUSBSerialDriver_v2_2_18.dmg file that was downloaded to your computer, and double click on it to open \ run it. Note: If you are not sure which version of OS X you have, click on the apple icon in the upper-left corner of your screen and choose 'About This Mac'. You will then see Version 10.X.Y -- use the 10.X to determine your system version. Now open the Arduino IDE. Under 'Tools -> Serial Port' you will now see a 'usbserial' option. Congratulations, you're all set! Note: You should only need to go through this process once. Every subsequent FTDI device you plug in should now have these drivers associated with it. However, if this is not the case, you can follow these instructions again for other devices. Note: If you have more than one FTDI device plugged in to your computer at the same time, all of the devices will show up in the Arduino IDE's Serial Port menu and device manager. To figure out which device is which, look under the Arduino IDE's 'Serial Port' menu. Take note of the names of each device. Then unplug the device you want to use. Go back to the 'Serial Port' menu. The device you unplugged should no longer be listed. That is the device you want. Plug it back in, and select the device that has now reappeared. You can determine what COM port an FTDI device enumerated to by opening the Mac OS X's "System Information" in Lion or later (or "System Profiler" in Snow Leopard and earlier versions of Mac OS). This is similar to the device manager used on Windows OS. Browse the Hardware > USB tree to determine what COM port the FTDI enumerated on. 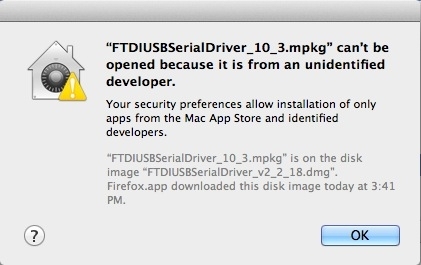 On newer versions of OS X, when you double-click the install packages inside the FTDI disk image, you may be presented with a very Windows-esque type error about not being able to open the files because they are not from an identified developers. This is very similar to the unsigned driver issue in Windows 8. To get around this, simply right-click the package you want to install, or press CTRL + click, if you don't have a right-click. Then select open from the menu. You will then be given another window asking if you are certain. Click Open, and proceed with the installation as stated above. Once open, click the Security & Privacy icon. Under the General tab, you should see a section about allowing the running of downloaded applications from specific sources. 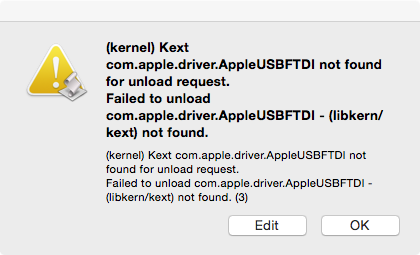 In preveious version of OS X, the defualt was set to Anywhere. 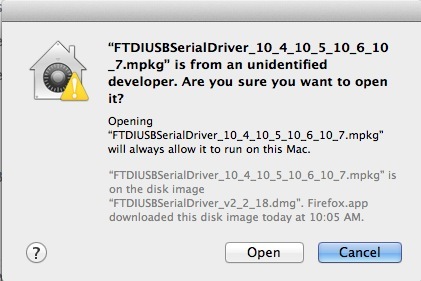 However, the defualt setting is now Mac App Store and identified developers. To use the FTDI drivers, you'll need to set this back to Anywhere. First, you may need to click on the little lock icon and enter your admin password to make these changes. Note for Educators: You may need to get you network administrator to come and unlock the computer in order to install these drivers. Once unlocked, click the Anywhere option. Another obnoxious window may appear asking you if you're sure you want to allow this. Click Allow from Anywhere. 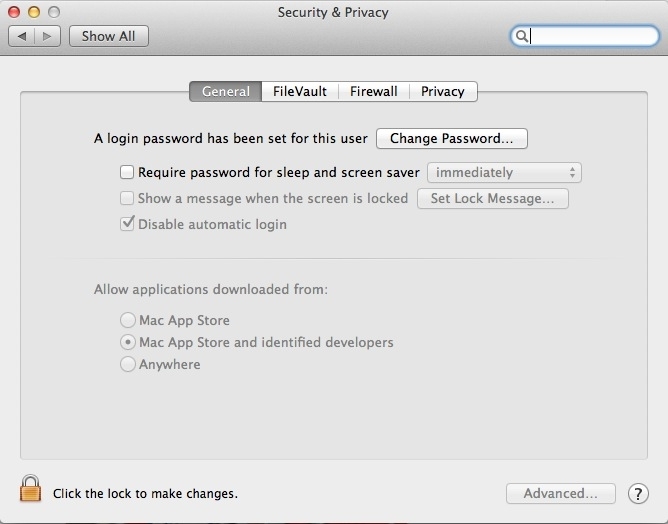 Or, you can follow the directions in this window, if you don't want to make your Mac "less secure." You should now be able to install the FTDI drivers. With Mac OS 10.9 (Mavericks) and later, Apple has built their own version of the FTDI VCP driver into the operating system (AN134). However, there seems to be some conflict between drivers from FTDIchip.com and the ones inherent to Apple. Luckily, there is a solution to this problem, and it comes from FTDI directly. If the above doesn't work, you may have better luck using this script from FTDI. 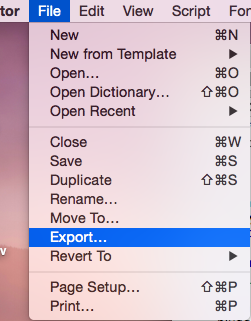 Clicking on this file will bring up the Script Editor on all Macs. The script can be run by clicking on the run icon (black triangle). Again, make sure your FTDI device is connected. In the Export dialog, select Application as the File Format. You can choose any name for the application. You should now have an automated Apple Script icon to use on your Mac. With the Apple supplied Drivers uninstalled, you may return to the top of this section and install the FTDI VCP Driver as needed. Repeat this process for any other FTDI devices you are using. You may need to repeat this every time you restart your computer. If you receive this error, it means that the driver has been uninstalled already, and you will need to install the FTDI VCP Driver, as stated above.